Rob Cesternino and Akiva Wienerkur continue their journey to watch every Seinfeld episode as they discuss Season 6, Episode 16, “The Beard“. Rob Cesternino and Akiva Wienerkur are only looking to convert everyone to Seinfeld fanatics as they bring you a new recap each and every week. 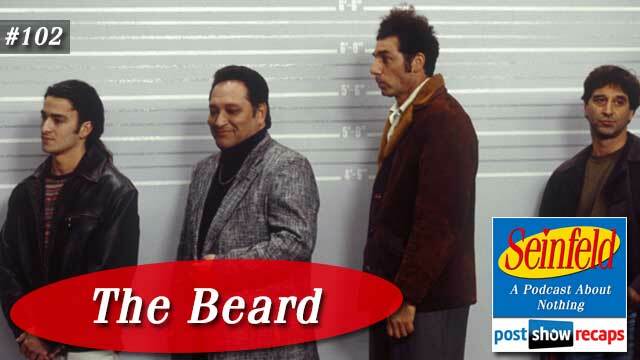 This time they break down “The Beard”, which first aired February 9, 1995 as part of season six. The episode was written by Carol Leifer. News – There was a bit of Seinfeld news this week. But first, Akiva talked about how there has been great feedback on the 100th voicemail show, adding that his wife confirmed off air he is not a nerd. Akiva shared how the real J Peterman catalogue is trying to resurrect the urban sombrero, starting a Kickstarter to raise $500,000 for this and a few other items, though they have only raised a few thousand dollars to date. Jerry’s Story – While at the police station waiting for Kramer’s friend to sketch a picture of the woman he wants to set up with George, Jerry meets an attractive police woman and gets her number. When they get together later, she shows him around the station, showing him the polygraph, sharing how one of the cast members ofMelrose Place was hooked up to that machine. Jerry lies about knowing anything about the show, but Kathy doesn’t believe him, so she makes him take the test himself to find out. Jerry goes to the best liar he knows for advice on how to cheat, and George explains that it’s not a lie if you believe it. Despite the advice, Jerry can’t pull it off, eventually admitting everything he knows about the show. Elaine’s Story – Elaine is going to the ballet with a friend of a friend named Robert, posing as his girlfriend, since his conservative boss may not be accepting of him being gay. She has such a great time, she starts to become attracted to him, hoping to get him to “switch teams”. She’s successful at first, but ultimately Robert realizes he can’t change who he really is. George’s Story – George is still wearing the toupee he was fitted for in “The Beard”. While Jerry and Elaine both think he looks ridiculous, Kramer loves it, and even wants to set George up with a friend of his. When George meets Kramer’s friend Denise, he notices she is bald. When he complains to Jerry and Elaine, Elaine is so incensed at his hypocrisy, since he is bald too, she rips off the hair piece after George tries to say he wasbald. George was happy to be back to his old self, but then Denise breaks it off with him for being bald himself. Kramer’s Story – Kramer wants to set up George with an old friend of his, but he doesn’t have a picture. He has a friend who is a sketch artist at a police station, so they all head down so George can get an idea of what she looks like. On the way there, he gives a Tupperware dish of Chinese food to a homeless man, but the man doesn’t give the empty dish back afterward. While at the police station, he’s offered fifty dollars to pose in a police lineup. The next time he sees the homeless man, Kramer gives him some change, but accidentally throws it in his coffee. Later, when the homeless man is a witness of a crime and Kramer is one of the stand ins at the line up, he points out Kramer as the suspect. Rob and Akiva’s Tangents – Rob shared that Nicole gets wound up at other people, especially the LA Mommy groups on Facebook, to which Akiva noted this is a good thing, keeping Rob from being the one to catch her ire. Rob asked Akiva if “Hammer Time” is over, but Akiva said it’s hard not to play the hits. Akiva noted that the actor who played Kathy the Sergeant is actually now married to one of the stars of Melrose Place. Akiva talked about how the kids show Peppa Pig is such a great You Tube video since it’s three straight hours. Rob’s son Dom was watching You Tube and Rob noticed one of the videos was a toilet bowl full of snakes. Lastly, Akiva shared how his appearance on the Survivor voicemail podcast last week boosted his Twitter followers from the 500s to well over 700. What wouldn’t work in 2016 – While they didn’t break it down officially, Rob noted that in 2016, people wouldn’t consider it an option to have someone switch sexual orientations. Grades and Rankings – Akiva really enjoyed Jerry’s story, giving him an A, while Rob didn’t buy that Jerry would be watching Melrose Place, giving him a B. For George, Akiva enjoyed it enough, but decided to go with an A-. Rob thought George was on top of his game, emphatically saying it was an A++. Both the guys agreed Elaine had one of her strongest episodes, so they both gave her an A. They thought Kramer had little to do, agreeing with a grade of a C or C+. Akiva liked the Melrose Place stuff, but thought it an average episode slotting it in at 85. Emails – To start with, Rob shared an anonymous email confirming that Akiva was a “massive nerd”, to which Akiva wanted this person to reveal his or herself. For the regular emails, Liz wrote in to agree with Akiva about not watching The Big Bang Theory, while Rob defended the earlier seasons of the show. Andrew D. wanted to know which Melrose Place actor who guest starred on Seinfeld is their favorite. They both agreed that the actress who played Mulva would have to take the cake. Johnny De Silveira argued that George should not be ahead of Jerry as the guy Kramer would set up a lady with. Akiva agreed George, even with hair and working for the Yankees is still below Jerry. Roger shared how he noticed that Elaine is obsessed with throwing things out the window. He wondered if it had to do with her pocket organizer getting thrown out the window, but Akiva confirmed that Elaine threw out the twenty dollar bill before the pocket organizer episode. James emailed in and said how his wife attended a “running of the brides” event, that is a one day sale of wedding dresses at the Filene’s Basement in Boston, causing a frenzy of brides to duke it out for the deals. Lastly, Chester wondered why George would claim to have a great personality. Rob thought George does well at first with his schmoozing, so the statement works. He also was confused why Kramer would apologize to the homeless man, when he should be mad still about the Tupperware. Chester also noticed the inconsistency of George being considered a master liar, but last episode was accused of having no poker face. Akiva and Rob felt strongly there is a difference between keeping someone else’s secret and lying. Tune in next week as the guys will recap “The Kiss Hello”. Send in your questions by emailing[email protected]. Don’t forget to subscribe to the podcast by going to postshowrecaps.com/seinfeldITunes where you can rate and review the podcast. You can get a discussion going about the podcast by leaving a comment on the show page, and as always, you can follow them on Twitter @robcesternino and @keev26.